Traditionally, user interfaces are a series of screens and forms for exchanging informations with the user. Most of the applications start with a main screen from which users can navigate using breadcrumbs, menus, buttons like back and forward. This paradigm remained almost unaltered with the coming of hypertext where one may jump from a page or dialog into another by visual links, that are immediately accessible. Chatbots shift UX towards conversational hypertext that produces the appearance of having a conversation with the computer. People can interact naturally, and since everyone already knows at least one natural language, nobody needs any training for it. Contextual memory in conversational applications plays a central role in any type of interaction between the Chatbot and the user. It is the bidirectional transfer of information where interlocutors are aware of the relational, environmental, and cultural context of the exchange. I will show some examples on how a contextual based system might improve the flow of the dialog. 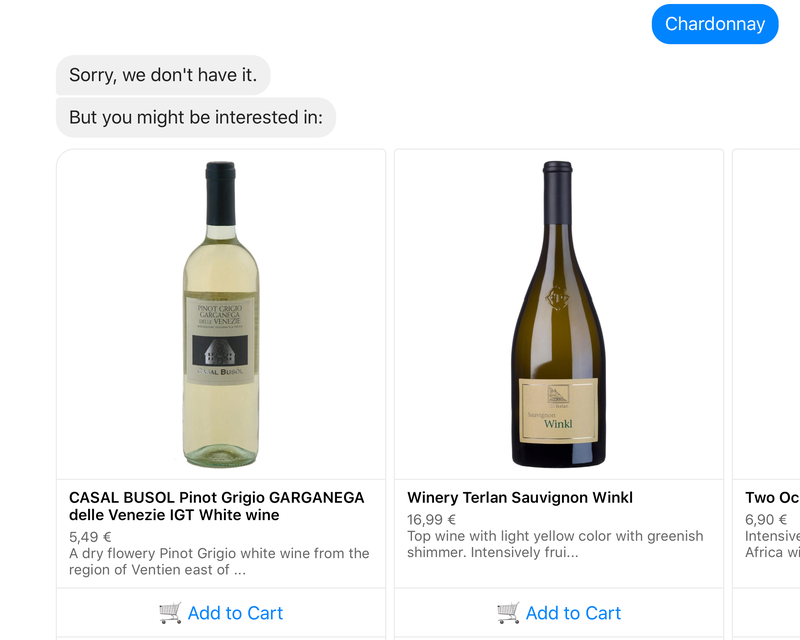 Keyword extraction from search queries is a fundamental aspect of conversational commerce. In this article I illustrate a simple but effective way to get relevant entities from user’s utterances and rank them against an unstructured product catalog and an ontology database. The primary purpose of a conversational application is to serve user demands, and when an user search in a e-commerce context, he is mostly looking for products. There is one main distinction that characterize a query when it is performed in the website rather than a messaging application. In the website, when users submit a query they already express their search intention, therefore the terms are usually concise and descriptive. Conversely, when inquiring a Chatbot, users use more expressive forms such as: Could you suggest me pale ale beers and ice creams for my party?. While the intention is deducted by a classification task, relevant terms for search, are just a subset of the entire sentence. In the Divine Comedy, Minos is a daemon appointed to guard the entrance of the hell. He listens to the sins of souls and indicates them their destinations by wrapping his tail as many times as the assigned circle. The figure is emblematic of the machine learning classification, where an entity is identified as belonging to a category or to another. Rather than condemning souls to endless pains, the harmless tool I am describing can judge whether an user’s utterance belongs to a specific intention, or to a limited range of emotions. Namely, it can serve intention recognition and sentimental analysis. The system recognizes the intention search and presents the results. Intention prediction is not an untackled problem and the market offers plenty of services. There are many players such as Google (Api.ai), Facebook (Wit.ai), Microsoft (Luis.ai) just for mentioning some of them, but this shouldn’t prevent further explorations in the topic, sometimes with unexpected positive surprises, as shows in the graph. The test was performed against real data used for training the deployed model of the Chatbot system and the results are relevant for the real working scenario, so no cherry picking in this case. 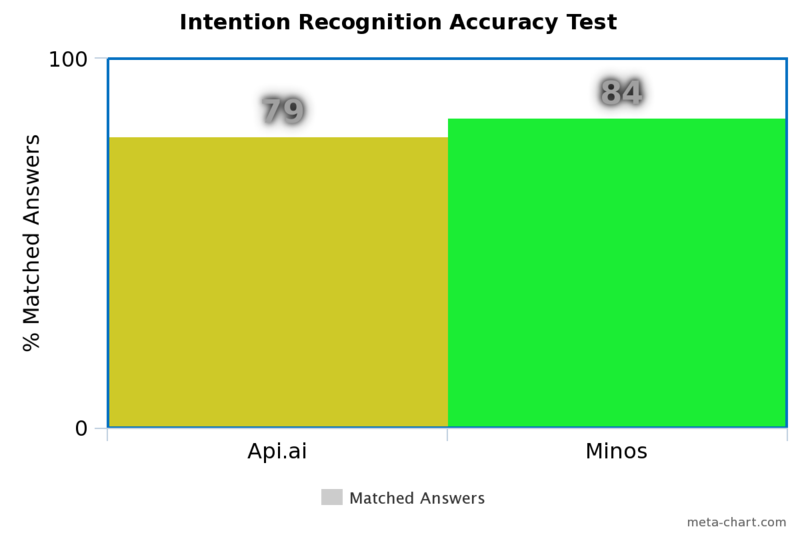 300 training samples, 56 test samples for 25 classes, these are the dataset’s numbers. Minos, the text classifier, uses an ensemble of machine learning models. It combines multiple classifiers for getting a good prediction out of utterances submitted to Charly. One of the models is based on Convolutional Neural Networks (CNN). The order of the words in text is not as important as the order of the pixel in an image. Humans percept text sequentially, not in convolutions. In CNN the pair adjective + object for example, could be recognized invariantly of its position, at the begin or at the end of a sentence, exactly like a face is recognized wherever it is located in the whole picture. It might seem more intuitive to apply Recurrent Neural Networks (like LSTM, Attention or Seq2seq) for text classification, due to the sequential nature of RNNs algorithms. I didn’t run any test on them so far, but I would promptly play with TreeLSTM. CNN performs well, and one might say that Essentially, all models are wrong, but some are useful, an essay the fit with the idea that final outcome drives the decisions, and experimental results play an important role. Alike any NLP, in CNN words are replaced by their correspective semantic vector. Most famous are Google word2vec, GloVe and FastText. I decided to make use of ConceptNet Numberbatch that took first place in both subtasks at SemEval 2017 task 2. Moreover, the vector file is very small (~250M) compared to Google News word2vec (~1.5G) and from an engeneering point of view, those numbers matter. Minos is still experimental and not well tuned, doors are open for improvements. An aspect shouldn’t be ignored on working with CNN is the Catastrofic Forgetting, an annoying phenomenon that ruins irrevocably the entire training.